The raising of militia tends to be either an emergency expedient, or else a cheap way of increasing apparent military resources, although often the result is not particularly valuable. In 1813 the new desire to liberate the German states from French occupation caused the creation of the Prussian militia, the Landwehr, and at first those who opposed this move found plenty to justify their criticisms. Clothing and equipping was very difficult and often basic in the extreme, and initially these were untrained men of very little value on the battlefield. 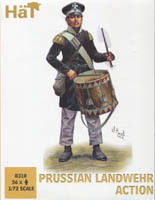 However in time the Landwehr were to prove their critics wrong and show they were a very useful force in the fight against the French. Although the regular Army always got the best of the available equipment, the Landwehr would find themselves in combat on numerous occasions and often acquitted themselves very well, becoming a large and significant part of the forces of Prussia. When first raised there was neither the time nor the money to set the men up as would have been desired, so they had a highly varied assortment of uniform, often including civilian items already owned by the men. The supply situation improved however, and by 1815 most were in a recognisable uniform, which was simple (and so cheap) by Napoleonic standards, but looked at from the modern viewpoint it was very modern and would herald the more practical uniforms of the later 19th century. Every man in this set wears the basic uniform, starting with the simple peaked cap which here has been done in the several designs actually used. All wear the litewka coat with double row of buttons, and trousers over gaiters and shoes. It was not a spectacular uniform, but it did the job and has been well done here. Weaponry had originally been whatever could be found, and many were given nothing more than a pike or other blade for want of muskets. Later this was resolved too, although the Landwehr continued to use a wide variety of muskets from various sources, not least captured French items. Every soldier here has a musket, although the detail is not good enough to be more precise, but the overall look is reasonable. Some have a sword as a sidearm, and some a hatchet. The man loading his musket has a half-length sword, which looks silly and is simply an error in sculpting rather than a genuine weapon. All bar the last two poses have separate packs which are shown in our bottom row. Some of these are packs, others simple canvas bags, and both are authentic. Other kit items include haversacks, water bottles and cartridge pouches, which are varied in style and so reflect the reality well. The sculpting of these figures seems to reflect the quite soft and flexible plastic they are made from – they have fairly soft features and lack the kind of subtle surface detail which makes a piece of clothing seem truly believable. Folds in clothing are few, and both hands and faces can be very basic indeed in some cases. Proportions are good, so from a distance there are no problems, but these are certainly not as good a sculpt as the very old Airfix set, for example. However they have almost no flash, and no excess plastic either. The drummer’s drum is separate, so looks OK, but the designer has badly messed up this figure as the strap for the drum goes to the left thigh, as it should, but the drum itself is positioned straight over the groin, which would be uncomfortable as well as completely wrong. The positioning of drumsticks is always a difficult problem on such figures, but here the result is really bad, so it has all gone wrong with this figure. Although the drummer pose has been singled out for special criticism, the other poses are on the whole reasonable. The pictures speak for themselves, but there is not much activity here, although some will find that a positive aspect to the set. For the rest, the poses are workmanlike if dull, and having three very similar ones does not help in a set of only eight. However the officer in the bottom row is quite peculiar. He holds his sword very lightly on his right arm – with the hand in this position he cannot be gripping the hilt, so has very little hold on it at all. Instead, he is sort of resting it against his upper right arm, which looks terrible, would be easily dislodged and suggests a very casual and sloppy attitude which simply looks wrong in a set labelled as ‘action’. There are some very good aspects to this set, and some very poor ones. Generally the accuracy is good, particularly for the later years such as the Waterloo campaign, and the main fighting poses are useful if nothing to get excited about. The drummer figure is a mess, the officer pose is inexplicable, and the sculpting generally is not appealing when looked at closely. Unlike the better Airfix set every man here has a bayonet fixed, but none have a scabbard, which is fine as many did without this in the Landwehr. One more peculiarity is each sprue in the set (there are four in a box) also includes half a drum. Why we cannot fathom. The drummer’s drum is whole and fits onto his groin, so what are we supposed to do with these extra four half drums? Not a big issue of course, but one more puzzle for a set with some good points and some very odd aspects, leaving us less than impressed and scratching our heads.